Welcome to the May issue of Weight Watchers magazine! We’re feeling extra motivated to get healthy this month. The days are longer, the skies are bluer and there’s a feeling of positivity in the air! To celebrate the new season, we’re packing more spring veg into our meals, moving our workouts outdoors, and overhauling our wardrobes. After getting to goal and staying there, our inspiring members are heading into the warmer months with a spring in their step, With just five months to go before her big day, bride-to-be Janine embarked on a mission to lose 2st of baby weight and fit into the dress of her dreams. Mum-of-two Toni lost nearly 6st, stopped avoiding her own reflection and now feels incredible in her new size-10 clothes. And, one year on, our columnist Marcia shares all she’s learned on her one-year journey to goal. Spring is a boom time for fresh produce, so there’s really no better time than now to up your fruit and veg intake. And we’ve got loads of recipes and tips to show you how. For starters, there are 15 unexpected ways to get more of your 5-a-day. Then, we give you the lowdown on why eating a rainbow of foods (not just your greens!) can lead to a healthier, more glowing you. Plus, the WW Kitchen team have been busy creating sweet and savoury waffles – and squaffles! – for you to try, and we’ve got healthy popcorn recipes to see through snacktime and beyond. As always, this issue is packed with expert advice on fashion, beauty, fitness and wellbeing. 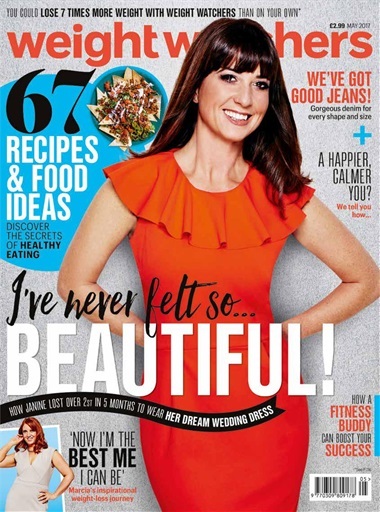 Fashion stylist Anna Woodham shows how to make spring denim trends work for your shape, positive psychologist Deborah Smith offers practical tips for feeling happier, calmer and more focused, and our fitness expert, Jennie Gadsby (along with more than a few members! ), reveals the power of group fitness.